A series of new guidelines might redefine how researchers study and classify Alzheimer’s disease. Experts in the field of Alzheimer’s disease are on the verge of redefining the devastating neurodegenerative disorder. And though the changes aren’t meant to influence how the 5 million Americans currently living with Alzheimer’s are cared after by their doctors and families, they are poised to shape the future of research into the disease for years to come. A coalition of 20 scientists, brought together by the Alzheimer’s Association (AA) and the National Institute on Aging (NIA) at the U.S. National Institutes of Health, were asked to review the current science behind what we know about Alzheimer’s, and if needed, to update the guidelines many researchers use to study it in people. Their guidelines frame Alzheimer’s as a set of similar symptoms that people have. But the new group decided to create a different set of guidelines for researchers to follow. Because research has advanced far enough, they argue, it’s time for scientists to rely on specific, at first unnoticed, biological changes that Alzheimer’s causes to the brain as a shorthand to understand and study it. These biomarkers—akin to using blood glucose readings to track someone’s diabetes—would be used to more easily chart the progression of Alzheimer’s disease up to 15 years before symptoms arise. “We envision that defining Alzheimer’s disease as a biological construct will enable a more accurate characterization and understanding of the sequence of events that lead to cognitive impairment that is associated with Alzheimer’s disease, as well as the multifactorial etiology of dementia,” they wrote. This proposed research framework, detailed in a paper published Tuesday in The Journal of the Alzheimer’s Association, would allow scientists to group volunteers in one of eight different ways, depending on the presence of three different biomarkers in their brain or spinal fluid. These biomarkers are beta-amyloid, tau, and apparent neurodegenerative damage. Beta-amyloid and tau are naturally occurring proteins in the brain that clump together in people living with Alzheimer’s, forming plaques and tangles respectively. 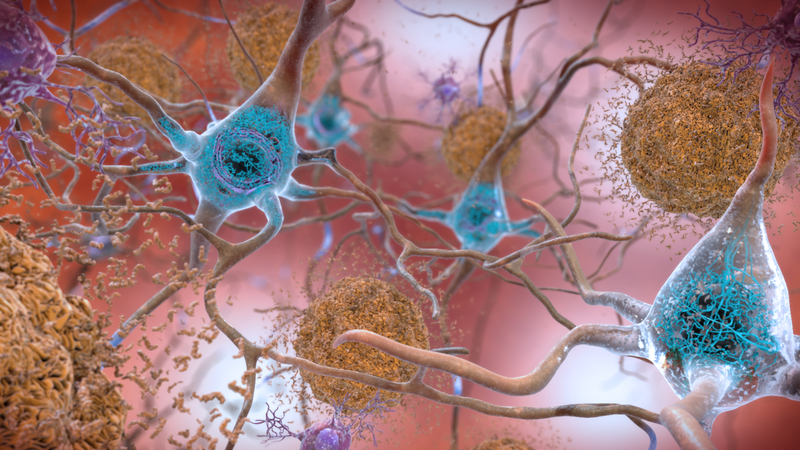 Beta-amyloid is believed to be more directly linked to the early progression of Alzheimer’s, but by the time the disease is fully recognizable in someone, both tangles and plaques litter the brain. Under the framework, a person with signs of beta-amyloid buildup but no tau would be classified as having an “Alzheimer’s pathologic change,” while someone with too much tau but not beta-amyloid would be classified as having a “Non-Alzheimer’s pathologic change.” Someone could only be classified as having Alzheimer’s disease if they had both beta-amyloid and tau buildup. Visible neurodegeneration, which does closely correlate with physical symptoms, would further differentiate patients, but isn’t necessary for the diagnosis. The authors say the new framework better reflects how our brains can become diseased. Oftentimes, for instance, someone’s mild cognitive impairment might not be caused by Alzheimer’s after all. These people could have too much tau buildup but not beta-amyloid. Or they could also have signs of early Alzheimer’s (beta-amyloid buildup) alongside other medical conditions that are more responsible for their overt symptoms, such as a traumatic injury. The guidelines, the authors warn however, aren’t meant to tell doctors how they should treat or diagnose patients in the real world, at least not yet. And they’re not meant to answer the elusive questions of what causes Alzheimer’s or how it actually destroys our brain. Researchers have long speculated that plaques, and to a lesser extent tangles, are primarily responsible for the damage Alzheimer’s causes, but not everyone agrees with that explanation. And efforts to short-circuit the progression of Alzheimer’s by developing drugs that target plaque production have so far abysmally failed in clinical trials, further denting the theory. But by defining beta-amyloid as a key biomarker of Alzheimer’s, the authors say, future researchers can better test whether it actually triggers or drives the cascade of events that leads to dementia or if it’s just some incidental change that merely coincides with the disease’s progression. In an accompanying editorial, members of the NIH who worked on the report emphasized that the framework is still a work in progress. As science advances, even more biomarkers might need to be considered, they admit. Before it becomes universally accepted by researchers, it should also be tested out with different groups of people across the world to ensure that it can really identify the different stages of Alzheimer’s. And though the NIH expects and hopes scientists use the framework in designing their studies when submitting for grants, they won’t shut out those who don’t use these specific biomarkers in their research. But by uniting Alzheimer’s scientists under a common language, the authors and respective organizations believe that it will be much easier to find potential treatments for a relentless disease that has so far resisted every attempt to slow it down.